Stewardship provides one such framework. I define stewardship as a framework that guides society to actively shape pathways of ecological and social change to enhance both ecosystem resilience and long-term human wellbeing. Given the increasing connectivity among ecosystems and societies at local-to-global scales, stewardship requires particular attention to interactions and connectivity—between humans and the rest of nature and among social-ecological systems within landscapes. This chapter briefly summarizes the ecological foundations of stewardship at the ecosystem scale and then describes in greater detail the ecological processes that link ecosystems within landscapes and that must be understood and managed if integrated social-ecological systems are to thrive. Stewardship supports the twin goals of ecological integrity and human wellbeing rather than privileging one goal over the other. In order to sustain the benefits that people receive from ecosystems (ecosystem services), they must sustain the fundamental ecological processes that underlie ecosystem services—a coupled interaction between people and the rest of nature. Ecosystem services include variables that change slowly, but which, once modified, are difficult to restore. In other words, they are highly resilient within certain bounds but exhibit threshold changes when these bounds are exceeded. For example, soil and water resources must be sustained to maintain the rates of water and nutrient cycling that are essential to support the normal ecological functioning of ecosystems. Similarly, biodiversity governs the types and identity of organisms present in an ecosystem, which are important in sustaining both the normal functioning of ecosystems and the needs of society. Landscape stewardship requires attention not only to the maintenance of soil and water resources and biodiversity within patches that form landscape mosaics but also to the interactions among patches within landscapes. 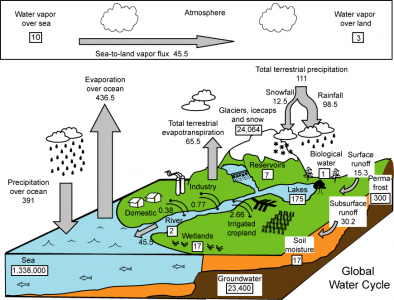 These interactions include regulation of water quality for downstream ecosystems, the use of multiple habitats by ecologically important species such as pollinators and predators, the spread or containment of pests, diseases, and disturbances (e.g., fire, floods, and human-mediated disturbances), and the regulation of climate at regional-to-global scales. These landscape processes (i.e., regulating services provided by ecosystems) are particularly challenging to manage because they often span multiple institutional jurisdictions and affect different user groups in different ways. In addition, ecological and social processes often modify landscapes in ways that are difficult to reverse, leading to novel social-ecological systems. Managing such landscapes requires attention not only to the structural and functional consequences of change but also to the spectrum societal values that dictate acceptable management goals and processes. The ecological foundations of landscape stewardship are thus intimately intertwined with social processes.